Based out of Noida, the UP Yoddha team has made a lasting impact on the sport in their debut season by reaching the playoffs. The team is backed by a strong financial setup and an impressive team of trainers and coach. Based out of Uttar Pradesh, the five thousand capacity Babu Banarasi Das indoor stadium is their home turf. Currently led by Rishank Devadiga, the team will surely be looking to up the ante and do one better after their dream debut. 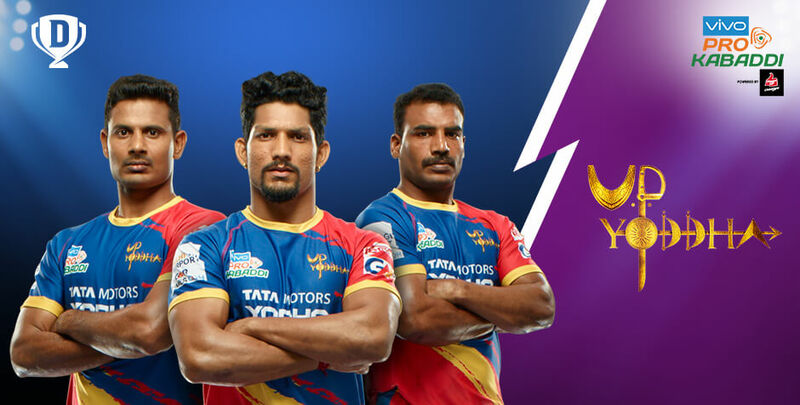 The UP Yoddha players 2018 jersey is coloured in red, blue, and yellow. Each colour symbolises a distinct trait to the warrior spirit. After falling short of tasting victory in their first season, this team is surely thirsty for the ultimate victory. Below are a few strong points of the UP Yoddha players in 2018. Rishank Devadiga will captain the side for season 6. The young raider brings valuable experience after a successful stint with U Mumba. In his first match as UP Yoddha captain, Devadiga scored 28 points against Jaipur Pink Panthers in the 2017 season. It has been the most points he has scored in a single match. Kabaddi veteran Jeeva Kumar had seven super tackles to his name in the fifth season of PKL, the most in that season. During season 5 of PKL, Nitin Tomar was the most successful raider in the team with 135 raids in 20 matches. Nitesh Kumar achieved the most successful tackles in the team during season 5. He had 46 successful tackles in 19 matches. With raiding being their speciality, the team scored an impressive 461 Raid Points in their debut season. UP Yoddha was one among only two teams in Season 5 that scored above 20 Raid Points per game. UP Yoddha captain Rishank Devadiga was the 9th most successful raider of Season 5 with 165 Raid Points. After Rishank, Prashanth Kumar Rai and Rohit Kumar Choudary have participated in the most raids with six each to their name. Prashanth Kumar Rai has also scored the second highest number of raid points, with 168 points in 60 matches. The UP Yoddha team 2018 has a line up of skilful youngsters with a fiery passion for the sport of Kabaddi. The team consists of players from various Indian states and also an international member Seong Ryeol Kim from Korea. Whether you support UP Yoddha or any other team in PKL, you can enrich your Pro Kabaddi experience to a whole new level with Dream11. Pick and choose your team on Dream11 and experience the thrill of being a team owner from the comfort of your home. Get playing with the nation and enjoy your winnings along with supporting your favourite teams and players. The Dream11 platform is a haven for Indian sports fans to come together and showcase their sports strategy skills. The platform engages users and allows fans to spice up the competition, adding to the excitement of the sporting seasons. So, download the Dream11 mobile app on your phone or get started on the official website today!